Mariellen will be joining me tomorrow night at Palm Springs Village Fest from 7 – 8 to demonstrate drop spindle spinning with my new kits. If ever you’ve been interested in spinning your own yarn, but were put off by the expense / investment of a spinning wheel, a drop spindle is the perfect starting point! 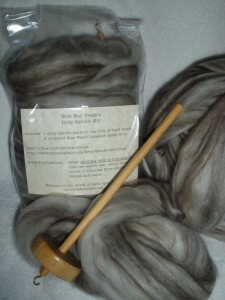 Ann may stop by, too, and I know she started her adventures in spinning with a drop spindle. The kits are $20 (which includes the sales tax). Kits contain 1 drop spindle (made in the USA) of hard maple, 4 oz premium dark and ecru (natural) Blue Faced Leicester wool, the link for a free e-book and how to find tutorial videos on YouTube. My booth is near the corner of Palm Canyon and Andreas, in front of Canyon Rose dress shop. Village Fest runs from 6 pm – 10 pm. Would love to see you! Reminder! No Village Fest Thanksgiving Day! Stay home, eat turkey, watch football or, perhaps spin with your new drop spindle? This entry was posted in Palm Springs Village Fest, spinning.